With more than a decade of experience in school reform, WestEd’s Fred Tempes knows how challenging it is for chronically low-performing schools to improve, but he also knows that almost any can accomplish dramatic turnaround. What it takes is “hard work around a core set of principles over an extended period of time,” says Tempes, Director of WestEd’s Comprehensive School Assistance Program. Sounds simple, but a basic challenge is that no one can make the improvement happen for a school. Rather, the entire school community must pull together collectively and do the work for themselves. With more than a decade of experience in school reform, WestEd's Fred Tempes knows how challenging it is for chronically low-performing schools to improve. He also knows that almost any can accomplish dramatic turnaround. It takes hard work around a core set of principles over an extended period of time. 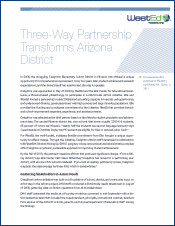 The struggling Creighton Elementary School District in Phoenix was approached in May of 2008 by WestEd and the Ellis Center for Educational Excellence, a Phoenix-based philanthropy, to participate in a districtwide reform initiative. Two years later, student achievement exceeded expectations, and the district itself has transformed the way it operates. 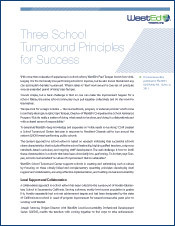 This policy report presents key findings from WestEd's five-year study of the Comprehensive School Reform program (CSR) and the agency's related study of the subset of CSR schools that made notable improvement under the program. 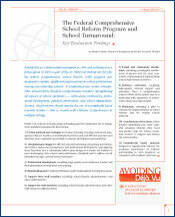 In identifying the policy implications for future turnaround efforts in the United States, the author also draws from a third, related study of how four other countries have been addressing the same challenge.